"LONG TO BE IN TEXAS, OR THE OLD PANHANDLE"
- Folks, this little poem is dedicated to ALL of the "True in Heart Texans"
Long to sit in the Texas sun, and let the days linger on, drink some moonshine beer I made called SINGLE STAR. It’d be music to my ears, if once again I could hear, the sound of a funky jukebox in a country bar. Long to sit on a Texas night, with them lighting bugs flickering bright, and see a cold pale moon high in the sky. There I’d know no fear nor pain, for once again, I could lay my weary head as night went by. and go back where I belong, to the land of country songs, and where blue eyed mama’s hold their babies dear. So Fort Worth, San Antone, here I come, my feet they’re tired of the road. Going back home to the old Lone Star, gonna dump off some of my load. California, Colorado, and Oklahoma City, they’re not the places for me. I'm going back to paradise lost and re-found, it’s TEXAS I long to be. So I’m gonna grab hold of that old panhandle, and cook my breakfast in the early morn. Grab forty winks on an old feather mattress, on the range by an old Longhorn. Yippi- ti- I- o, get along little doggie, it’s no mis-fortune for me, cause the sky is blue, and the Cedar smells sweet, and the mocking birds sing in the trees. People are friendly, and look mighty healthy, when they’re raised on that Texas sunshine. Davy Crockett, and “Big” Jim Bowie, I’d call ‘um friends of mine. Grab hold of that old panhandle, and cook my breakfast in the early morn. Grab forty winks on an old feather mattress, on the range by an old Longhorn. 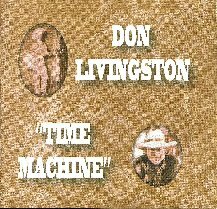 Click to Play "Long to Be in Texas"
Don Livingston's music of "Long to be in Texas"is available on this CD titled DON LIVINGSTON……“TIME MACHINE” for sale in THE MERCHANDISE SECTION. Dr. Shepard said,......"I love this CD!!. It made me dance for the first time in 27 years, and grew hair on my head so I had to order a new hat from LONGHORN HATTERS!!!!!... IT'S,....... A TRUE COLLECTOR’S ITEM!!!" "I spent some time in Hubbard today", listin' to tall tales in a little cafe, Old timers" talkin' 'bout horses and things, of huntin', and cows, and why there's no rain. History of ranches, of cowboys, and such, stories of cousins, and family with trust, Stayed in a room with ghosts from the past, hoping their presence would some how last. With a big, white fence encircling the grounds, The Mockin' Birds chirped with their own special sounds, The Elm tree swayed to the rhythm of the breeze, while a yellow jacket flew around with ease. "I spent some time in Hubbard today", only to leave, but this I do pray, That nothin' but good comes at this time, to a warm, friendly house, built in 1909. *This poem was written for Jean Savage on August 29, 2005 about the wonderful house she owns in Hubbard, Texas that I visited. "Hello, My name is Dr. Cletus Shepard, and I'm here today to talk to you about dogs. Dogs are man's best friend, even women's....especially Poodles. Call 'um and they come, feed 'um and they're happy, pet 'um and they lick your face, talk to 'um, and they miraculously understand every word you say when you talk "baby talk". Why whole movies have been based on dogs......"OLE SHEP", "OLE YELLER", "LASSIE", RIN-TIN-TIN", "BULLIT"....even movies like "LADY AND THE TRAMP", and "101 DALMATIONS" were about the escapades of dogs and their life styles and problems!!! Dogs are cute, and can learn how to sit, stay, shake hands, walk up step ladders, fetch, and eat a bone when YOU don't want it anymore. Dogs help the blind, help the police, help the ranchers, and greet you with a waggin'tail, when you come home at night. Even Snoopy is a dog!! Why would anybody want to own a Hamster, when you could own a Chihuahua about the same size that has brains, and doesn't run in circles all day? My name is Dr. Cletus Shepard, and I was here today to talk to you about dogs. Now, if you never break a sweat nor pitch into a wreck, It’s logical to wear a silver-belly hundred-x. But if you mix it up outside an air-conditioned rig, Then feller, you should buy yourself a Palm Leaf Lid. Hand-built for twenty dollars, It's a workin' puncher's tool, A straw that will screw down on your head; It'll stick tight to your noggin' when your pony breaks in two, And the wind won't send you chasin' for your Palm Leaf Lid. Just 'cause you're drawin' wages, On the top-side of a horse, Don't mean that you don't need to look well-bred; When your Palm gets catty-wampus, You can curl it in the trough, And keep a touch of fashion in your Palm Leaf Lid. Them fellers with their creases starched and custom beaver felts, With trophy wives a-danglin’ ‘round their trophy buckle belts, Could play the cowboy better if they’d ante up their bid, With a smear of dirt and sweat upon a Palm Leaf Lid. In a world of mass-production and corporation crap, The workin’ man still builds the pyramids. But you can bypass their constructions if you trade that dandy’s cap, For the hand-made signature inside a Palm Leaf Lid. Tall Tale written by Jack L. Houchen, Greeley, Colorado featuring THE HIGH PLAINS DRIFTER and Friend. A while back, a cousin of the same family name on my Mother's side of the Family, Morrison, asked if I wanted to help move a few head of Longhorns to a Rail Head near El Paso; he just asked that I not make fun of his given name and we would be OK! Marion was a big man of few words. I knew he took care of his kin, and I trusted him as a great American, and......., I needed the work, so we were soon on our way. Along the trail we stopped at a lonely Railhead Bar to cool our dry throats. I hung my favorite hat on a near by peg. I turned my head, and the hat made by an old friend, one Don Livingston, was gone! Marion said, "what's wrong?" I said, "some rat stole my best hat." He said, "Well pilgrim; let's go get it back!" We caught the scoundrel at the corral. Marion grabbed him by the collar and the dude said, "who the hell are you!" "I'm Marion Morrison," was the response. The creep said, "Marion?? "....., with a sneer. A huge fist to the face greeted the culprit. He fell like a brick, and while my hat spun in the air, Marion snatched it out of mid-air as he mumbled,"I've got to change my name.........., too much trouble!" Once, when my sons were both living in India, I sent some books to Trevor, one of them, All The Pretty Horses. He loved the book and begin to roll cigarettes and eat an Indian version of tortillas and beans. I was planning a visit and Trevor wrote to me saying, "Dad, can you bring that hat, the one with the bullet hole in it when you come?" (I had an old Stetson that had a hole in the front and I told him that it was a bullet hole.) So I brought the hat and he wore it everywhere and would go into the little town 10KM away and sit outside in a little cafe with a friend smoking and wearing the hat and pretend he was John Grady Cole, the boy who rides his horse into Mexico in the 50's and gets into BIG trouble....., Submitted by "COWBOY" Bob Livingston, Musician, Song Writer, Recording Artist, Performer, and World Traveler. Copyright © 2019 by Don Livingston's Longhorn Hatters® Maintained by Longhorn Hatters.